These Dark Chocolate Cherry Oatmeal Cookies are your favorite old fashioned oatmeal cookie made even better! With the addition of dark chocolate chips and chopped fresh cherries, they’re a sure sign that summer’s finally arrived. When I see them in the store this time of year, I just cannot get enough of them. Whether I put them in Pound Cake, Cherry Oatmeal Muffins, or we just eat them as is, they never last long here at the 365 homestead. We also love oatmeal cookies, but I wanted to make them with something other than your standard raisins. I mean, those are good and all, but why not use what’s in season and think outside the box (haha, the raisin box! Get it??). They worked perfectly, too and the use of the dark chocolate just seriously takes your cookie to another level. For some reason, I feel more sophisticated when I’m eating dark chocolate, too like I’m special and it’s a treat. Just humor me here, k? 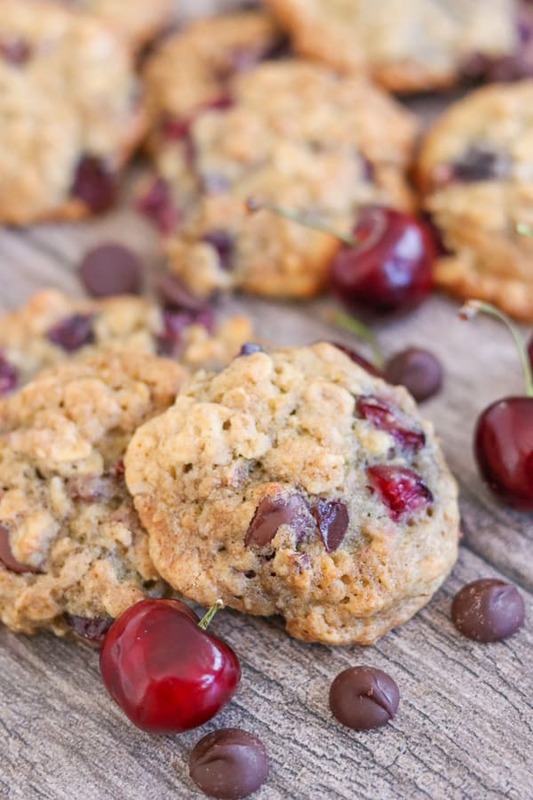 So, RUN, don’t walk to the store to get some fresh cherries and make these cookies. You really do need to make them. 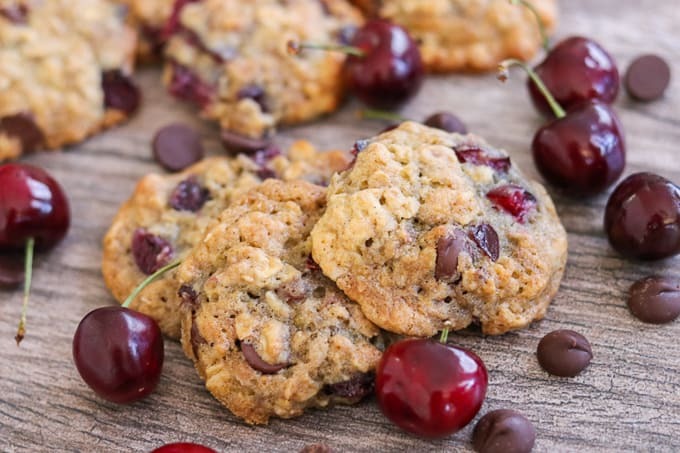 SAVE THESE DARK CHOCOLATE CHERRY OATMEAL COOKIES TO YOUR FAVORITE PINTEREST BOARD! And I even give you permission to use more than the amount of dark chocolate chips called for in the recipe. You can barely see them (if at all), but they’re in there! It may be because I only used a cup. See, when Old Mother Hubbard went to the cupboard to fetch her poor cookies some chips, the stash had been broken into. Oh, that lovable son o’ mine. He loves to open up those bags and just help himself., he does. Soooooo…when the momma is baking away and doesn’t take inventory of all necessary ingredients, she runs into some …what’s the word I’m looking for? Hitches, snags, ah, forget it. While you can grease your cookie sheets or put the dough on sheets without preparing them at all, I certainly wouldn’t recommend it. Ask me how I know. Use this stuff and you’ll just save yourself a whole heck of a lot of trouble trying to scrape the cookie remnants off. Trust me. This Kirkland brand is the only kind I use because it rips perfectly every time and lasts me quite a while. A cherry pitter. This one had the best ratings on Amazon, but THIS ONE looks like a heck of a lot more fun AND you can pit 6 of them at once. Yes, SIX!! Admittedly, I don’t have a cherry pitter and dug them all out by hand. Not fun, so you can be sure I’ll be adding one of these babies to my utility drawer pronto. No more red-stained fingers for this lady. I used these, but honestly, I don’t care which ones you use. You use the brand you feel most comfortable using. Heck, you can even use semi-sweet or milk chocolate. BUT dark chocolate IS supposed to be better for you. 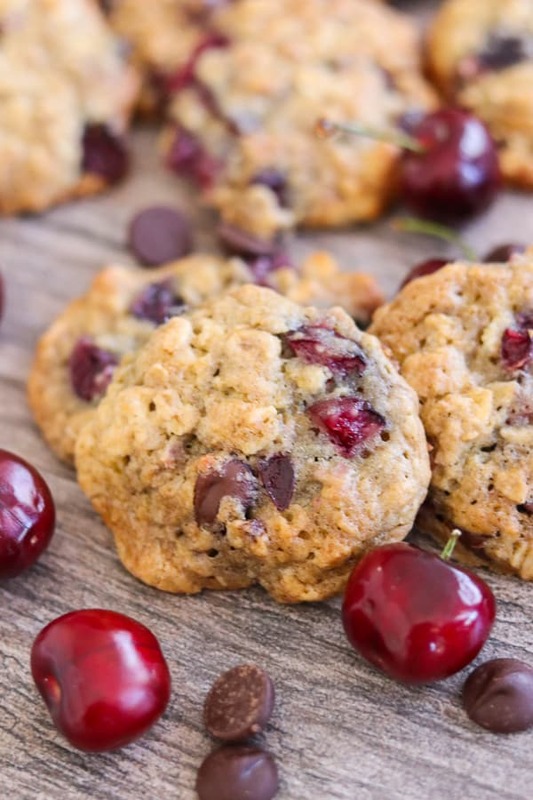 Besides the delicious and good-for-you cherries in these cookies, too eating these are a win-win in my book! 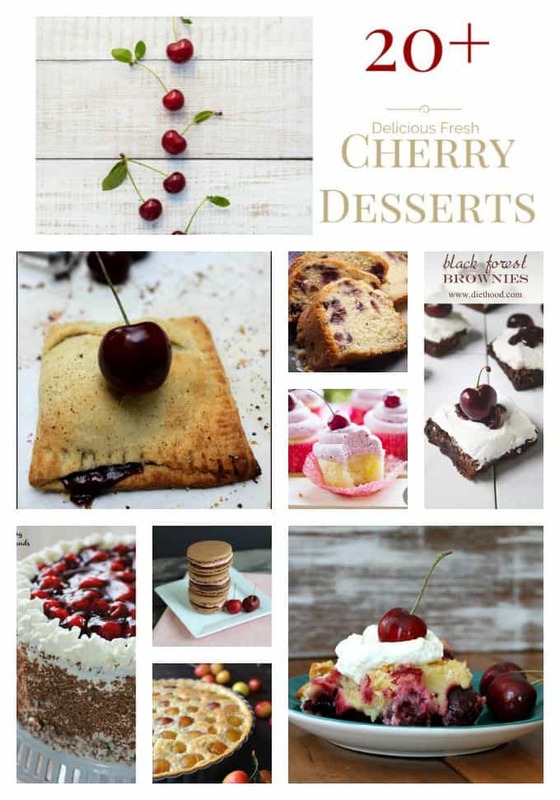 Want to make more delicious goodies with cherries? 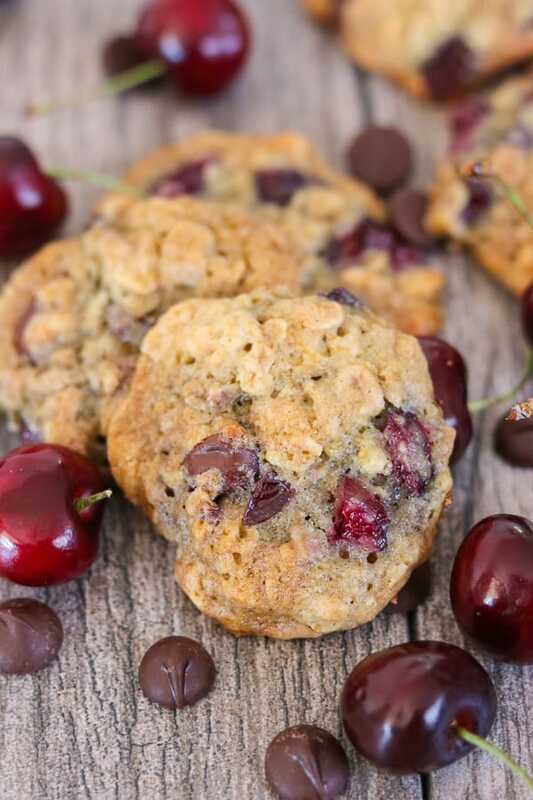 These Healthy Chocolate Cherry Cookies from Well Plated will be the perfect afternoon snack. Give me a couch, a book, a cup of tea and a few of these to snack on and I’m good to go! Start your summer morning off with this Cherry Coconut Lime Smoothie from Wishes and Dishes. The flavors sound incredible and a smoothie is a great way to get any day going, especially if you need to be out the door in a hurry. 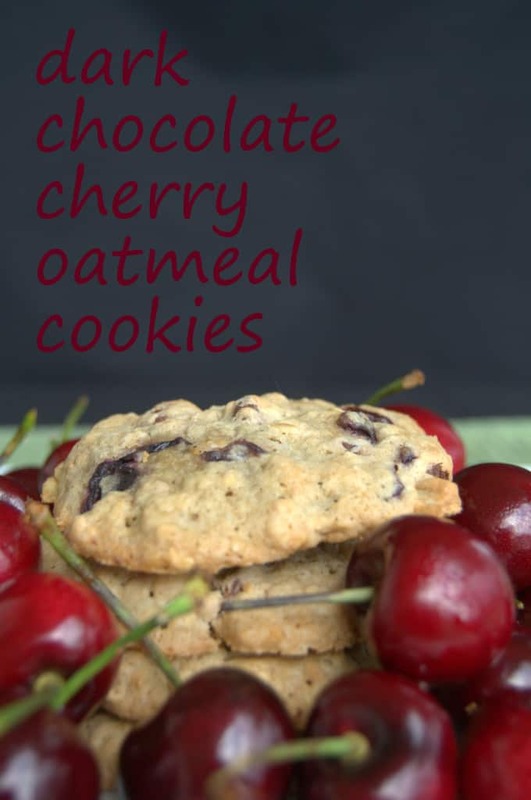 These Dark Chocolate Cherry Oatmeal Cookies are your favorite old fashioned oatmeal cookie made even better by the addition of dark chocolate chips and chopped fresh cherries. They're a sure sign that summer's finally arrived! Preheat the oven to 350 degrees F and prepare two cookie sheets by lining them with parchment. In a large bowl, whisk the flour, granulated sugar, brown sugar, cardamom, baking soda, and salt together. Stir in the beaten egg, melted butter, milk and rolled oats. 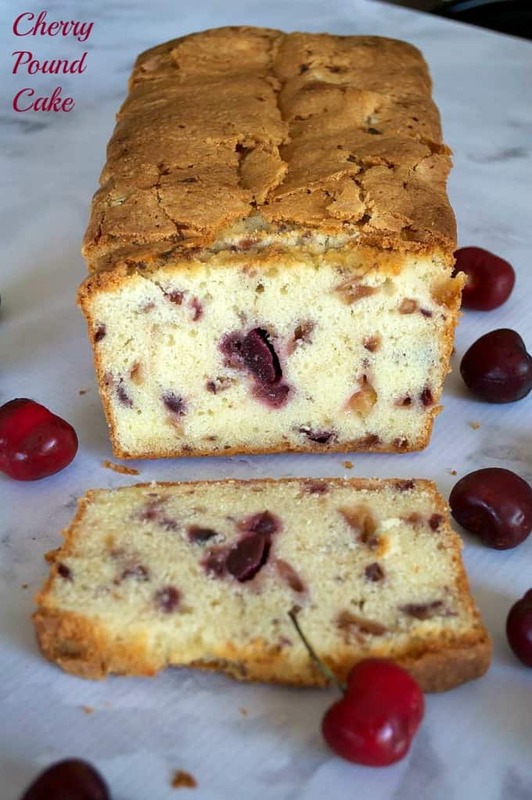 Fold in cherries, but do not overmix. Arrange by tablespoonfuls on prepared cookie sheets about 1 1/2 inches apart as they will spread as they bake. Bake until edges are just slightly golden, about 10-12 minutes. I rate everything I make on a scale of 1-4 and these Dark Chocolate Cherry Oatmeal Cookies earned 3 1/2 rolling pins. 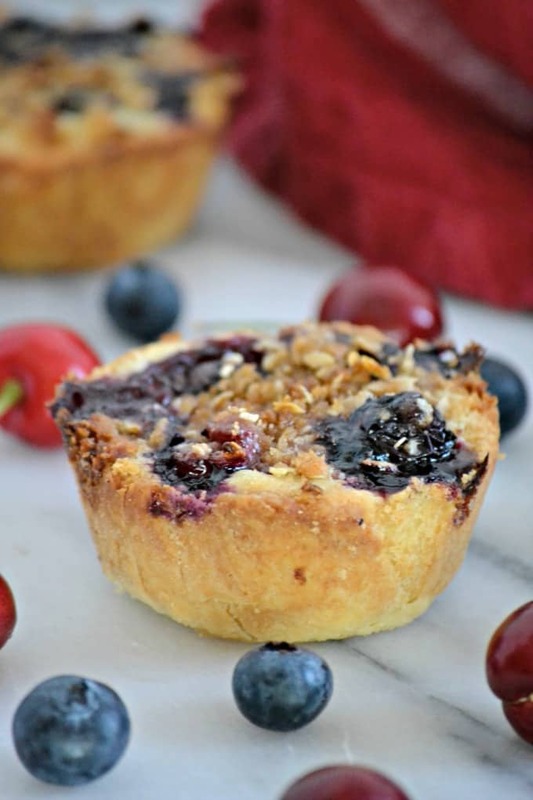 I’ve always loved oatmeal cookies and removing the raisins and substituting them with fresh cherries was a wonderful change. And of course, chocolate always makes everything better! Cherries will be gone before you know it, so go get some today!! This post was originally published in July 2014. Updated June 2018. **These are links that can take you to a product (or products) that I recommend. I do receive a portion of the sales or credit for my future purchases from any items purchased through those links. Your purchases encourage my baking, cooking and butter habit, and contribute to the life of this blog. I thank you so very much for your support. Let’s keep having fun in the kitchen!! Can’t wait to make these. I noticed that the recipie does not say when to add the chips and cherries, I am assuming it is after everything else is blended. I also deal with allergies, what are the natural foods you are talking about? My hubby will love you for this. He’s obsessed with cherries! Thanks, Ashley! I hope he enjoys them!